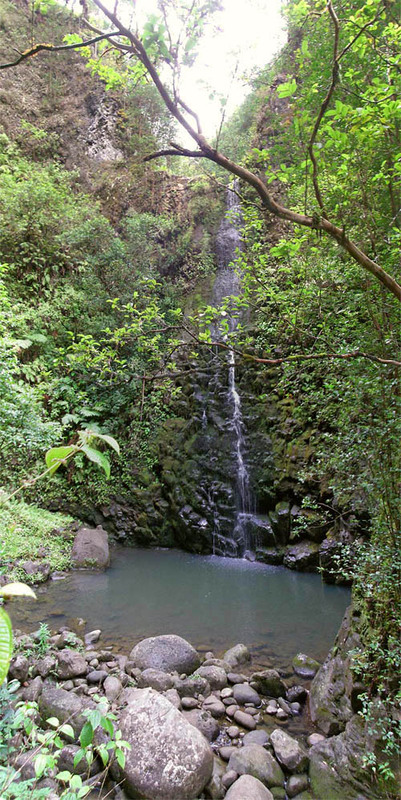 I joined the trail maintenance crew of the Hawaiian Trail and Mountain Club (HTMC) to clear the Koloa Gulch trail in Hau’ula which leads to a charming waterfall and pool at the end of the gulch. 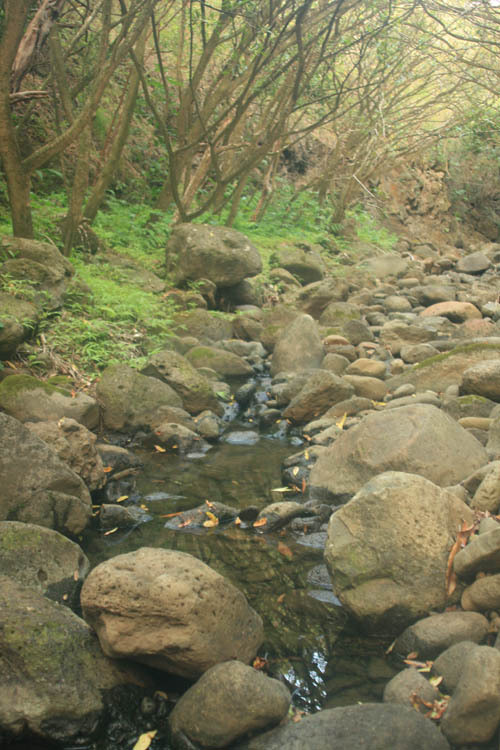 Koloa is one of a series of narrow stream gulches in Hauula including Kaluanui, Maakua, and Kaipapau where native hau trees once grew in great numbers at the mouths of these streams. 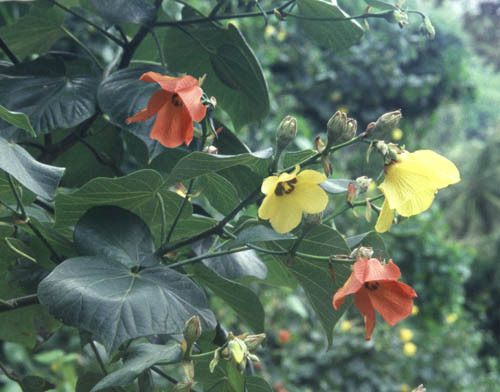 Hau’ula is named for the red flowers of hau trees which have an odd characteristic. 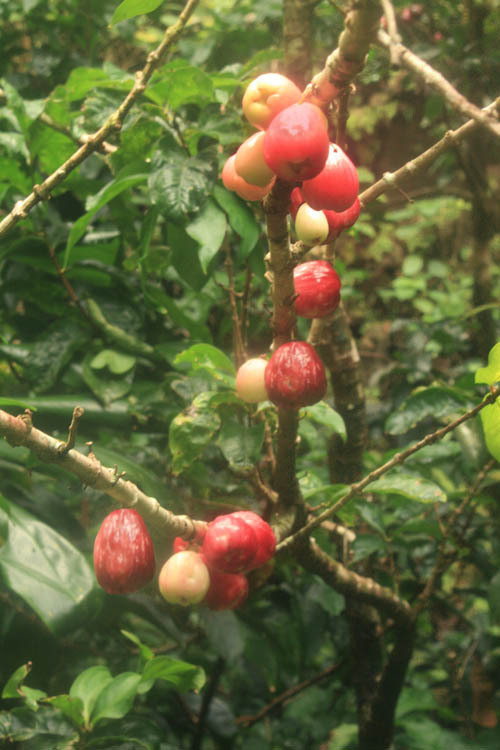 Hau flowers start off yellow when they first bloom and then turn red as they age and fall off the tree. It is curious to see hau trees with new and old blossoms (yellow and red flowers) at the same time as shown in the photo above. The hike to Koloa Gulch starts by climbing a ridge covered in iron wood trees with a view of Laniloa Point with several small islets just offshore. 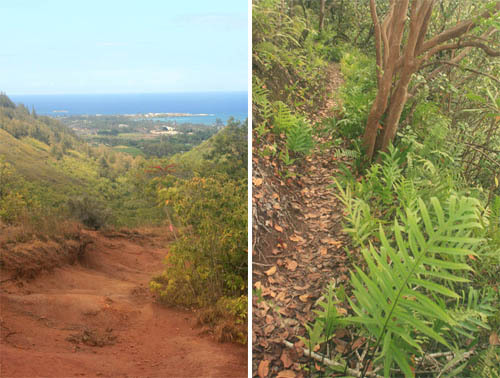 The trail then veers off the ridgeline and drops down through strawberry guava and lauae ferns into Koloa Gulch. When we first reached Koloa Gulch I noted how little water there was in the stream. 2008 has been a relatively dry year all over Oahu. Despite the low flow this year, Koloa Stream is one of a handful of streams on Oahu with sufficient flow to reach the ocean unimpeded. 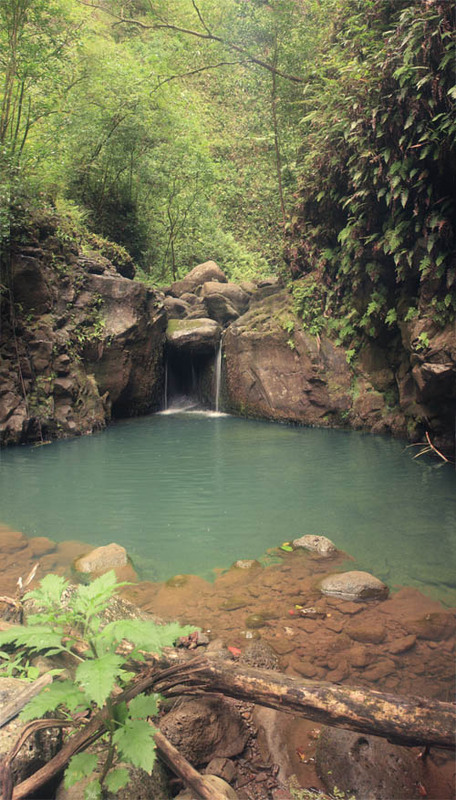 As a result, Koloa Stream is home to several rare native stream creatures not commonly found on Oahu. 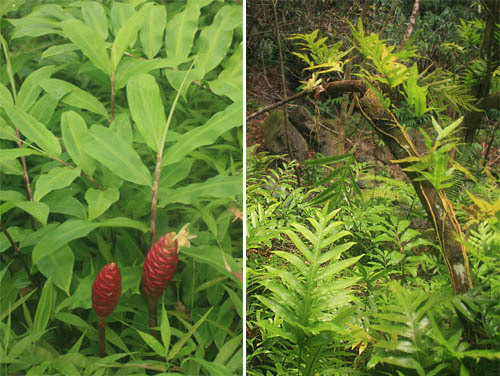 Awapuhi ginger (above left photo) and lauae ferns (above right photo) thrive in Koloa Gulch. As we proceeded along the trail, I could not resist squeezing the red cones of awapuhi to release the viscous shampoo conditioner they contain and crushing the fronds of lauae ferns to release their sweet maile-like fragrance. The pleasant aroma of ginger and lauae filled the air. One of the more interesting creatures in Koloa Gulch is an exotic introduced slug which is evolutionarily halfway between snails and slugs. The slug carries the remnant of a shallow oval shell on its back which is too small for it to retract inside. 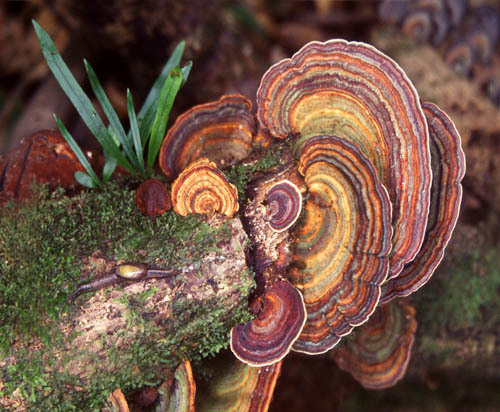 In the photo above the slug crawls over a moss covered log with bracket fungus. There are many stream crossings as we made our way further into the gulch. Along several of these crossings, we saw introduced Malaysian prawns with long pinchers and ‘o’opu akupa (Eleotris sandwicensis) which is endemic to Hawaii. 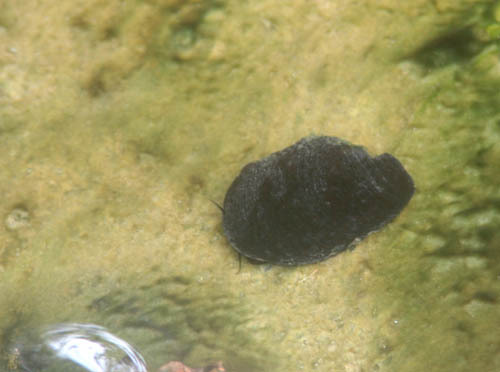 One of the rarer creatures we saw in Koloa stream was Hihiwai (Neritina granosa) , a freshwater relative of the opihi (limpet). These creatures are endemic to the Hawaiian Islands and are uncommon on Oahu. They grow to about the size of a half-dollar and have short antennae which extend from under the shell as they crawl over rocks in the stream. Hihiwai lay eggs on the rocks in the months of June through August. When Hihiwai eggs hatch their larvae flow downstream to the sea and spend about a year in the ocean as plankton before they crawling upstream from the ocean to spend their adult lives in freshwater streams. Many mountain apples trees were full of fruit as we made our way deep into the gulch. We picked and snacked on delicious mountain apples as we made our way to the waterfall and pool at the end of the trail. The final bend in the stream leads to a charming mountain pool with a small waterfall. Since the stream flow was so low, the small waterfall was a mere trickle. There is a rope on the left side of the pool which one can use to climb to the next level where a much higher waterfall is situated. Pat Rooney climbed up the rope to reach this 40 foot waterfall. Pat is known for amazing panoramic photos which can be seen at his website. Many thanks to Pat for allowing me to use his photo. After having lunch alongside the pool, we made our way back out Koloa Gulch. I was pleased that the native hihiwai, ‘o’opu, and other stream creatures continue to survive despite the low stream flow. May they continue to survive in Koloa Stream for generations to come.